- Harvest time for Olive Oil! The high quality oils are obtained by hand picking the olives directly into a basket the best method of all but the least efficient and so the most costly. Picking “by hand with a net” is the next best method, with 50% more production resulting than when just a basket is used. By hand with a net, with the help of plastic rakes and sometimes long wooden sticks, is probably the most common method in Sparta. The weather at the time of harvest is of great importance, and experienced farmers know when it’s the right moment to start - before the wet, cold days of fall set in. 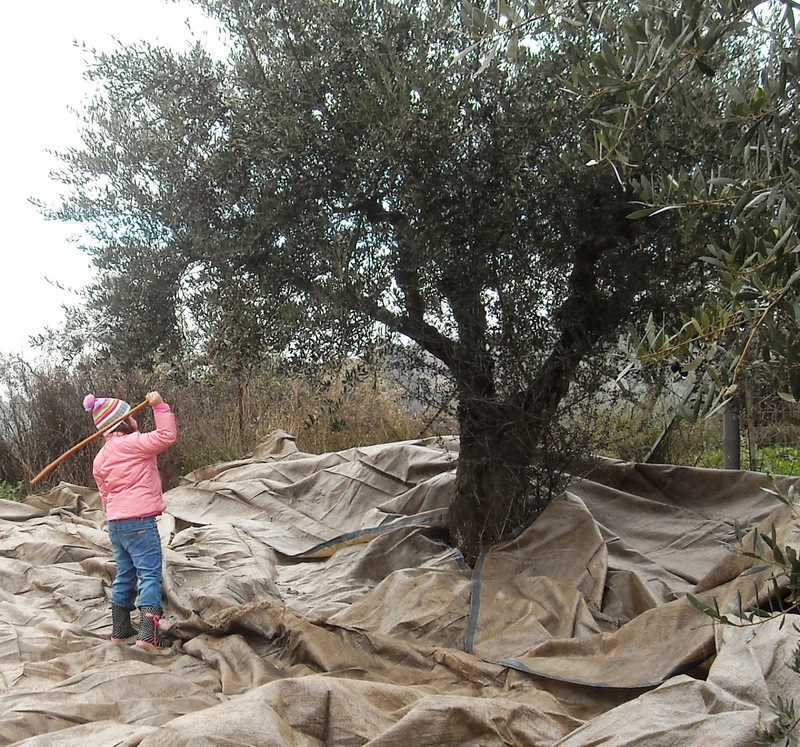 It’s impossible to pick olives in rain, wind, or fog for many reasons: besides the obvious dangers and difficulties of climbing trees and ladders in wind and rain, moisture can cause the olives to spoil in their crates before they are taken to the mill, for pressing. Fortunately, Greece is usually blessed with many splendid, sunny days for harvesting olives. Usually, one to three people work on a tree, first laying down the net, which is slit in the middle, like a pair of pants, so that it fits nicely around the base of the tree, like a bib. Nowadays the nets are made of nylon, but years ago, burlap was used. One person starts on the upper branches, while the other(s) work on the lower ones. With your hands - you slide the olives gently down the branch, as if sliding beads off a necklace, and just allow them to drop where they may onto the net below. Both the green and the black are harvested; a mix of the two makes for the most flavorful olive oil.